I don't often cook with toasted Israeli couscous. It's not because it's complicated to prepare, it's just that it's not a very common ingredient to find at the market. I personally like it because it can simply be boiled and serve as a side dish. I flavored it with puréed Japanese eggplant and a bright, sweet and tasty pistachio pesto. 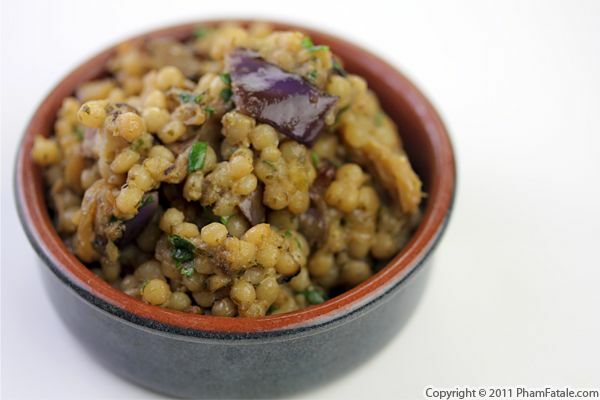 I served the warm, green Israeli couscous with veal scallopini, which was absolutely delicious. There was some extra pistachio pesto, which I stored in the freezer for future use. I don't know what I'm going to cook it with, but I can tell it will be scrumptious! Fresh pesto is delicious, easy, and bursting with flavor. 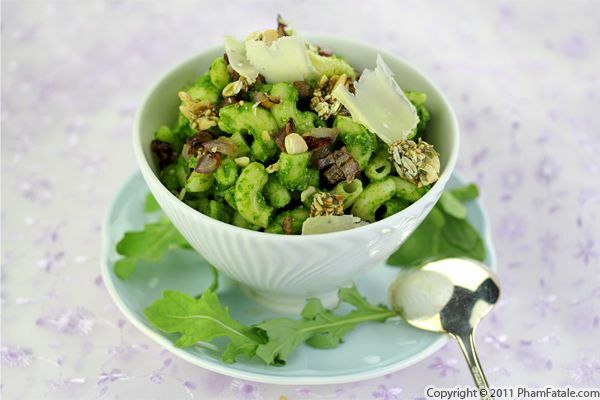 It’s also incredibly versatile in that you can use many different types of greens to modify the flavor. Today I was so happy my experiment with turning French mâche into delicious Pesto proved to be delightful and nutritious. To make the pesto, I paired the mâche lettuce (pronounced [mosh]) with champagne pear vinegar because both are so delicate and flavorful. I kept the dish very simple; I tossed pasta with garlic and a little cream. Once the pasta was well coated, I added the mâche pesto and finished the dish with lemon zest and colorful peppercorns. The flavor combination was inspired by store-bought lemon pepper-flavored pappardelle pasta. I repeated the same flavors using lemons, green, pink and black peppercorns and a touch of champagne pear vinegar (doesn't that sound luxurious?) that I recently received from our friend Jacilyn from Bellindora. This company is four-generation family owned and is located in the heart of California's San Joaquin wine country. I've tried both their premium vinegars (cherry balsamic and champagne vinegar) as well as their fruity extra-virgin olive oil and they make wonderful pestos and salad dressings. If you want to win this trio of bottles, enter today's Bellindora giveaway! Make sure you're a fan of PhamFatale Facebook fan page or follow @Phamfatalecom and tweet about this giveaway. 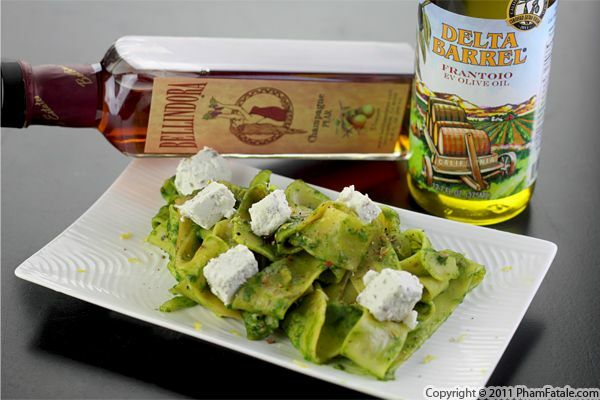 To make it easy, you can just copy and paste this tweet if you’d like: "Champagne Pear & Balsamic Cherry Vinegars + EVOO #Giveaway from @Phamfatalecom and Bellindora: http://bit.ly/sp4V7y". I came up with this new dish after I received masala marinara pasta sauce from our friend Dave of DavesGourmet.com. This special sauce was the winner of the Sofi Award for outstanding pasta sauce in 2010. 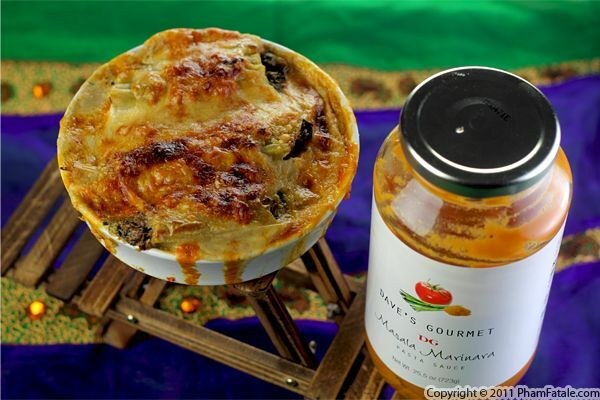 The sauce is very creative and definitely has a South Asian flair with hints of ginger, coconut and kaffir lime leaves. It's a must try. Since the sauce itself is a fusion of cultures, I thought it would be fun to continue the theme and make an Italian pasta dish with Indian flavors. I made Indian-style pearl onions cooked in onion masala sauce, called dopiaza. I used that mixture to flavor manicotti stuffed with ricotta cheese and a generous helping of French triple cream cheese. If that sounds a bit decadent to you, well, it is! If you're itching to try the sauce I used in this dish, Dave's Gourmet kindly agreed to be a part of our 25 days of giveaways. For a chance at winning, just go to our 25 Days of Giveaways page and enter. We'll announce the winner tomorrow! Make sure you're a fan of PhamFatale Facebook fan page and Dave's Gourmet or follow @Phamfatalecom and tweet about this giveaway. 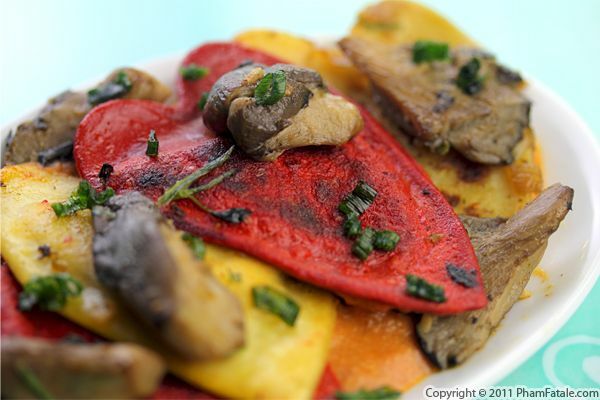 To make it easy, you can just copy and paste this tweet if you’d like: "Dave's Gourmet Pasta Sauce #HolidayGiveaway from @Phamfatalecom and @DavesGourmet: http://bit.ly/vVk4L8".